I recently purchased the Nest Learning Thermostat. I’ve been wanting one for a year now. Since buying it I’ve received a lot of questions, from how easy is it to install and is it worth the $250 price tag? So I thought some of our fine readers may have the same questions, so I put together a little video showing just how easy it is to install. Have a watch. As you can see, it’s so simple. It should take you less than 30 minutes, and that includes the setup after you turn the power back on. As for my first impressions, I’m very impressed so far. It’s a lot more sturdy than I had expected. It’s easy to control, and when you download the App to your iOS device, you can control the temperature in your home from anywhere. It takes about a month for Nest to start providing you with information about energy savings. I’m looking forward to see if it delivers on its promise. So yes, once I start getting those results I’ll have a full review. 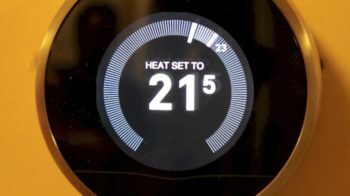 Let me know what you think of the Nest Learning Thermostat. Is it something you’ve been interested in? Do you already have one? Let us know in the comments. You can get the second generation Nest from Amazon.ca for $249 or the first gen for $199.